It was a tough ol' week last week wasn't it? I went away for the weekend as hubby said I was brooding, and stayed with a lovely friend where we talked and laughed and philosophised, putting the world to rights. On the way back on the train I watched the stunning Irish countryside flash by. Mountains, lakes (loughs), bogs, woodland. Foxes, hares and even a little hawk were spotted. And as I took note of all the nature a sense of peace replaced the anger and sadness which were still hiding in my heart. I had felt injustice at what I saw was an unfair loss. And the natural world around me reminded me of my place in the grand scheme of things. Even if we don't understand, things are as they should be. I have been pondering on this sense of tranquility which settled on me at what was a very difficult time. There was a lesson there to be learned, I am sure. And I am reminded of that special time of the year which is just around the corner. No matter what your religious faith, any time of the year which brings people together and makes us feel greatful for what we have is a wonderful time. And I do indeed have a sense of gratitude. Today I am here and well. Today is a good day. I'm not sure what I believe in most days but I know there is something and I know that come Christmas time, it is there by the bucketful. I guess there isn't a specific lable for my faith and that is fine. In the countryside I was a part of during the weekend, there were no lables either but I know there is a purpose behind it all, even if I have yet to find the specific reasons and instructions for life. And with the optimism we feel at the beginning of a new week or even month or year if we have been suffering from life's difficulties, so came the good news that my hubby's uncle's prognosis is not as bad as we thought: the cancer seems to be only in the liver and so seems to be treatable. Fingers crossed and prayers please. So with a brighter outlook than I could even being to foresee last Friday, I can also tell you my other news. Perfect in Primrose should be ready next week and the last of my ladies, Bonny in Blue done and dusted by the week after. That will be the last of my Victorian Pretty Maids in a Row, but I really and truly have fallen in love with the Victorian era. I was doodling away last week and doing some research on Victorian clothes and I had a flash of inspiration. I have just completed my first larger chart, one for public use rather than just for my pleasure. It is called simply 'A Victorian Christmas' and it consists of lots of the elements the Victorians would have experienced in their christmas celebrations. I have divided it up into 9 segments: each segment will be approx 50 x 60 stitches. Not all will be solid stitching and I have designed it so the seperate motives can be individual ornaments if you wish. I have shown it to a few people and they seem to love it (and they are generally trustworthy!) so the first section will be released on here on Friday with a completed stitching example so you can see what it's like. But it is a bit of a mystery! I will only reveal one section at a time! Sounds good? Well, feel free to join in. The design will be given in DMC threads and my example is on a natural/ mocha coloured linen. 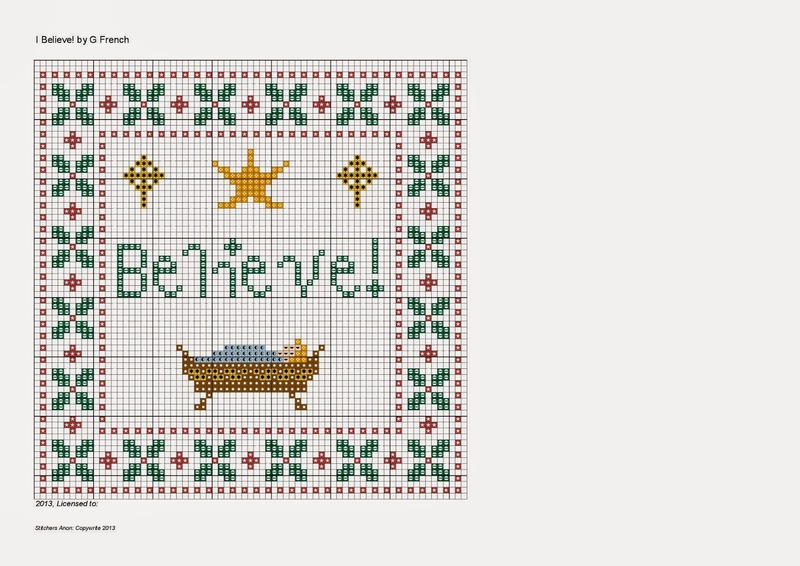 The finished design is 10.21 x 12.8 inches (approx 14 count) or 143 x 179 stitches. Let me know if you want to join in and I will put your names up with links to your blogs in my sidebar so we can see how you get on! Such good news about Uncle's prognosis. What a lovely hubby you have to send you off for a weekend with friends to enjoy some girlie time. I had a stitching friend here for coffee yesterday and it really does lift the spirits, and the friendly (hug) that accompanied her was very much appreciated. Thank you for your words. I too am going through a very difficult time and am extremely stressed out! Your words have encouraged me. glad your weekend away helped. Lovely freebie. Beautiful post and beautiful chart ~ hugs!